Garage doors aren't our only area of expertise. We also specialize in repairing and installing residential and commercial gates. Our technicians can take care of a wide variety of issues that may prevent your automatic system from performing optimally. Our company works with a lot of the industry's leading manufacturers, and we can install a lot of different types. Wrought iron swing gates have a distinct appeal that many homeowners go for due to its prestigious vibes. Rolling and sliding gates, on the other hand, are often preferred for the enhanced sense of security they offer. Our experts will happily consult and guide you through the different options. Similar to garage doors, gate systems also use an opener in order to operate automatically. The safety sensors that prevent them from closing down on you or your car are also similar to the ones used in garages and therefore must also receive a similar treatment. Our technicians will test them out to make sure they are positioned correctly, realign them if they aren't and replace them if their lenses become too scratched to function properly. If your swing gate hinges are about to fall off, or have suffered some type of damage that compromises their condition and purpose, our team can help. 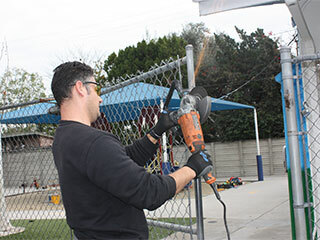 We'll weld them back into place, and make sure your gate is able to open and close effortlessly and quietly once again. Whether you need us to fix something with your existing intercom, or install a new in its place, we'll be happy to help. Our experts can even help you choose the type of system that will be the perfect match for your home or business. Nowadays, there's no longer a need to walk to your gate in order to see who's waiting outside it. A video-com system, for example, can add a sense of legitimacy to any business, and increase the security of any home. You can count on our team to restore your opener to a good working condition whenever something goes wrong. We can replace broken or worn out motor gears, and even repair various issues with the inner circuitry. If the problem doesn't appear clear at first, we'll troubleshoot it until we find the root cause. Our team at Garage Door Repair White Plains can help you with any automatic gate-related issue. Contact us today to learn what we can do for you.